I have a unique background and diverse skills. I worked for a Fortune 500 company based out of New Jersey coordinating international sales and marketing. I then relocated to the beautiful Black Hills of South Dakota and was highly successful in domestic sales for that same company, generating sales growth of over 200%. I then went on to acquire my Master's Degree in Counseling and was a program director for a successful nonprofit program growing it by over 400%. I have served on Rapid City's government as a council member and monitor trends and changes. I am an avid runner, having completed nine full marathons. I will go the distance for you! I also love animals and am a board member of the Humane Society of the Black Hills. I believe integrity is something that a person should show by example and great customer service is what people should expect. I have already received Coldwell Banker LKH's Exceptional Customer Service Award multiple times. I have tested and passed my real estate broker exam and teach at the Black Hills School for Real Estate---educating people to help them join the real estate field. For me, real estate provides an opportunity to help people through one of the most stressful times in life-the buying and/or selling of a home. With my background I have the tools and knowledge to make that process as stress-free as possible. I look forward to helping you discover your dreams! © Copyright Ron Sasso 2018. All Rights Reserved. 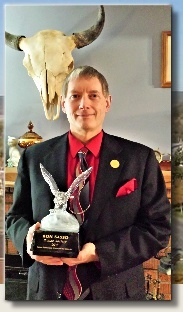 For the best information on Black Hills real estate, please visit Ron's real estate specific website at www.BlackHillsSDHomes.com. If you are looking at selling your home or want to purchase a home, please give him a call at (605) 593-3759 and he will gladly assist you. His real estate website includes his real estate blog. These are links to Coldwell Banker LKH's monthly Rapid City real estate market reports. The monthly reports are reflecting the prior month's sales information. Please contact me with any questions that you may have or if you would like to buy or sell a home. Older reports are further down on the page. Ron Sasso won a Coldwell Banker sales performance award for his sales production.